In September 2012 Kelly and I did a week long liveaboard dive trip in Indonesia which went from Bali to Komodo and back. We went on the MV Mermaid II. Click here to read about the boat. 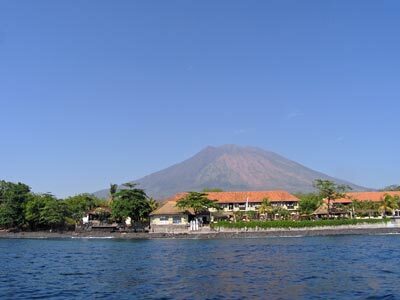 The following week we travelled to Tulamben where were spent another week diving the north-eastern coast of Bali. 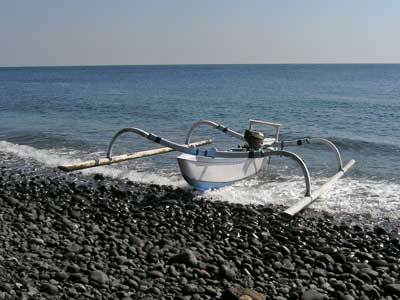 We used Tulamben Wreck Divers, click here to read about the town and dive operation. This is one of the dive sites we did during the second week. 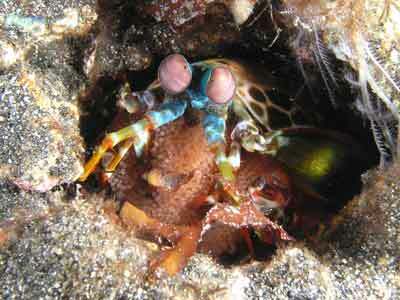 There are literally hundreds of dive sites located within a few kilometres of Tulamben. Elam Anand (at least I think that is how it is pronounced/spelt) is located at the southern end of Tulamben and is one of only a couple of dive sites that are accessed by boat. An approximate GPS mark for the dive spot is 8° 16' 47.8"S 115° 35' 58.1"E (using WGS84 as the datum). 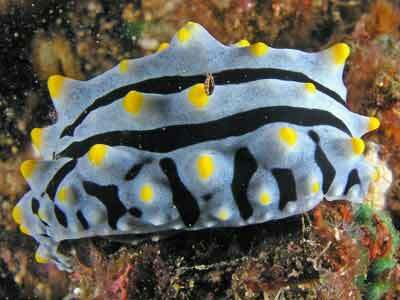 As with virtually all dive sites that you do here, you gear up at the dive shop. However, rather than walking to the actual site, you walk to the beach where your board a small outrigger boat to be taken to the site. Your dive gear is transported by porters (on their head or on a scooter) to the beach and is then loaded into the boat. In our case, the boat left from the beach right near the main USAT Liberty car park. The small boats can carry three divers and the driver as well as second tanks. The boats are not powered by an outboard motor, but by a simple four stroke engine, in most cases, a small Honda. These have a shaft attached to them with a tiny propeller at the end. From the beach, you head south parallel to the shore till you round the point south of The Drop Off. This site is in the next bay around. To dive out of these little boats, you first put on your fins and mask and weight belt and then your BCD and tank is dropped in the water. You get in after it and put it on when in the water. At the end of the dive, you take off your weights and pass them up to the driver. You take off your BCD and the driver pulls it and the tank up into the boat. Take off your fins and then climb up the ladder. Easy! Anyway, as mentioned, this dive starts in the small bay in about seven metres or so. The bottom is gently sloping sand that goes down very deep. The dive plan is to do a drift dive back towards The Drop Off and the beach. There is a slight current running north-west (that is in the direction we want to go) so we just float along. 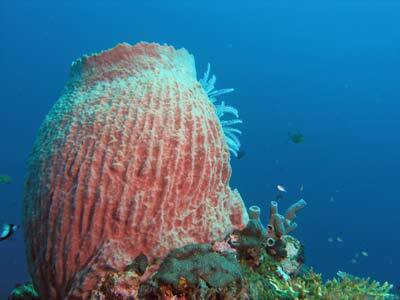 The bottom has a lot of finger sponges on the sand and soon the slope becomes a very steep wall, with lots of coral. This drops to at least 40 metres. 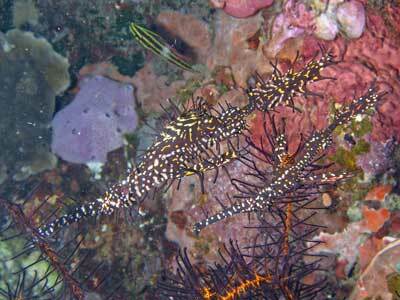 There are many large gorgonias, sea whips and barrel sponges on the wall. Once you reach the planned maximum depth, it is a simple matter to then start a slow ascent which keeps you well out of decompression. The wall has a few small nooks and crannies in it which means there are lots of spaces for things to grow and hide. 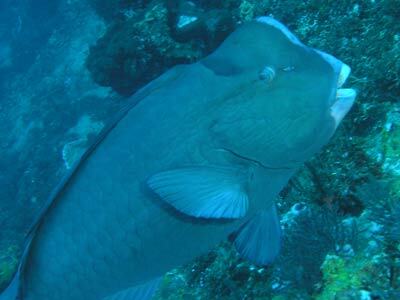 Off the wall we see a school of barracuda, a large hump-headed parrotfish and some other large pelagics. 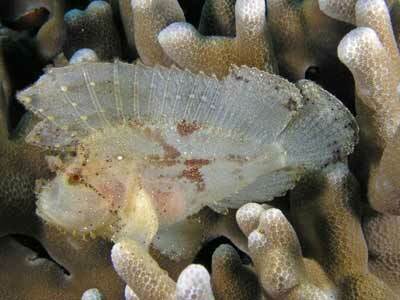 On the wall we see a pale coloured leaf fish, a lot of interesting nudibranchs and many species of shrimp. Eventually we end up on the top of the reef in about six metres where we do an extended safety stop. After 50 minutes we surface. This was a very nice dive, with an interesting boat trip. The visibility was probably 30 metres and the water temperature was about 27°C. Click here to see the dive profile from my computer. 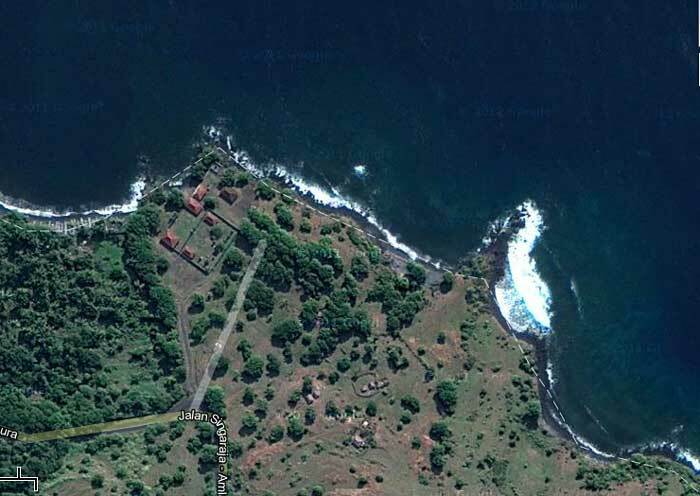 Click here to return to the list of sites we did at Tulamben.